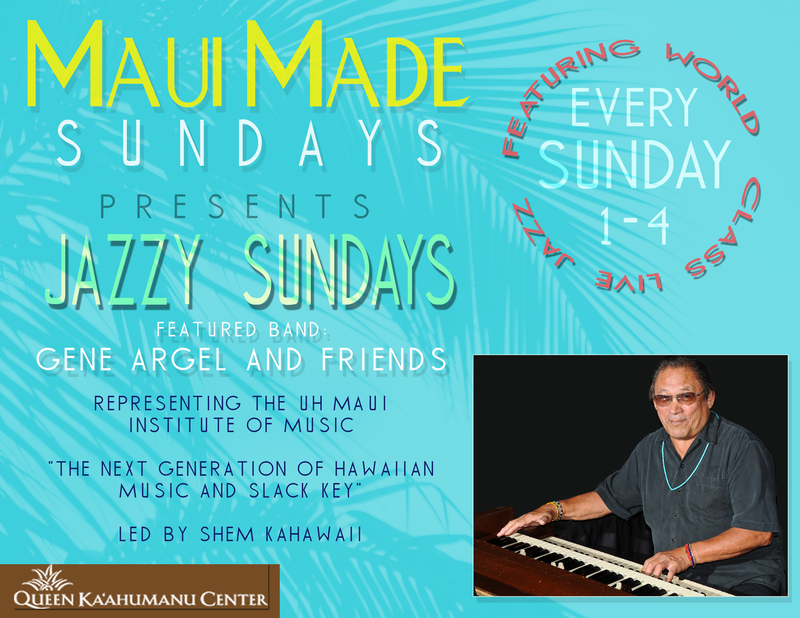 The Queen Kaahumanu Center will join forces with “Jazz Maui” to produce a weekly concert series featuring world class Jazz, blues and Hawaiian music. Gene Argel and Friends will serve as the house band and will feature weekly guests including top local and visiting mainland and international musicans and vocalists. Additionally, the show will also feature performances by accomplished local students in training towards professional music careers and a jam session which will allow visiting musicians to sit in. 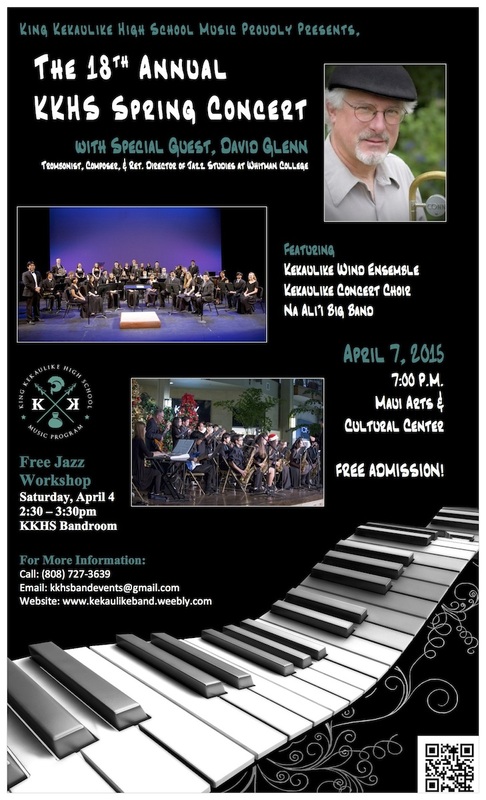 We are greatly appreciative of Queen Kaahumanu Center for providing this opportunity. It is with the support of the Center that the series can be offered as a free event open to locals and visitors. The center will also produce a special “Made On Maui” craft fair featuring an array of Maui artisans set up throughout the mall during the concert. 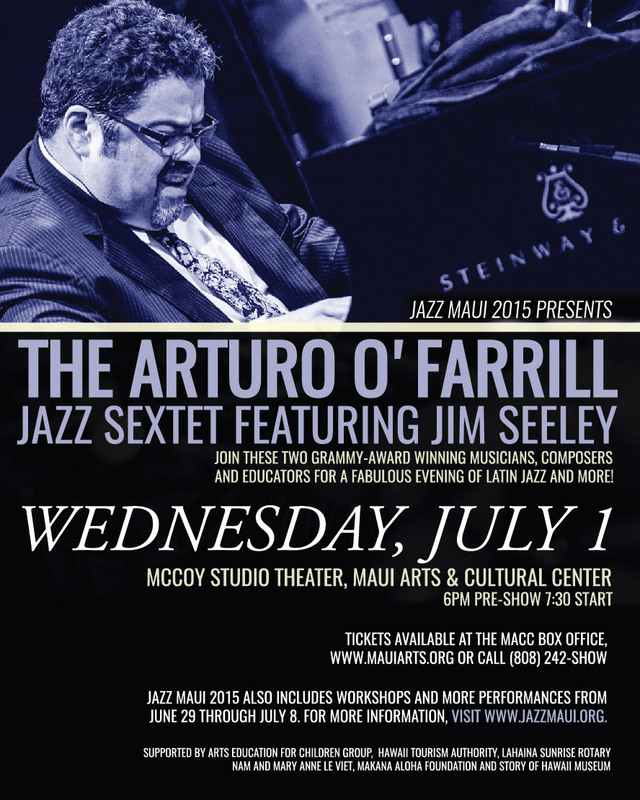 The audience will be treated weekly to one of Hawaii’s top Jazz combos led by multi-talented Gene Argel playing with a combo of top accompanists. A Tacoma native, Gene Argel left the Pacific Northwest in his early 20s to gig in Las Vegas, Los Angeles and points west. The westernmost of those was the Hawaiian island of Maui, Gene’s home since 1982. 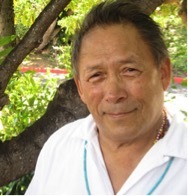 That Gene has earned a living on Maui for over 30 years playing jazz attests to his talent, versatility and open heartedness. As both leader and “house pianist” for countless club gigs, Gene has backed all the visiting class acts who come through; recording stars Branford Marsalis, Emil Richards, George Benson, Bill Perkins and Steve Gadd; as well as fellow islanders Gabe Baltazar and Henry Allen. Whether on piano, keyboards or his beloved B-3, Gene distils the full quantum of beauty and passion in hisperformances. Dave Glenn was Director of Jazz Studies and professor of low brass at Whitman College in Walla Walla, Washington from 1989 until his retirement in 2011. He received a Bachelor of Music in trombone performance from North Texas State University and a Master of Music in composition from the University of Northern Colorado. Dave spent eleven years as a professional trombonist in New York City and while there, played for ten years with the Gerry Mulligan Concert Jazz Band and toured extensively with Bill Watrous’ Manhattan Wildlife Refuge, Diana Ross, and Lou Rawls. He also subbed on tours with Chuck Mangione, Blood, Sweat and Tears, and the Mel Lewis Orchestra and was on the Grammy Award winning recording Walk on the Water by the Gerry Mulligan Concert Jazz Band. Dave has also recorded two jazz CDs of his original compositions and arrangements, Journeys and National Pastime (released in June 2009). He has composed five commissioned works for orchestra, the latest being “Romantic Fantasy on Themes by Mozart” for the Walla Walla Symphony in 2015, and numerous chamber works including “Fireflies,” the title piece of a CD by the Free Range Saxophone Quartet (Origin Classical Records) and “Sculpture Garden for Piano Quintet,” commissioned by the Walla Walla Chamber Music Festival. Dave Glenn is an endorsing artist for Conn/Selmer, a member of the American Composers Forum, and an Origin Records recording artist.